French pianist Michel Beroff was born in 1950 and graduated from the Paris Conservatoire at the tender age of 16. The following year, he won first prize at the first international Olivier Messiaen piano competition. Since then, he has been hailed by the critics for his interpretations of Messiaen's music. He has played with the most prestigious orchestras around the world, under the direction of conductors such as Abbado, Barenboim, Bernstein, Boulez, Dohnanyi, Dorati, Dutoit , Eschenbach, Gielen, Inbal, Jochum, Leinsdorf, Masur, Ozawa, Previn, Rostropovitch, Sinopoli, Solti, Tennsted, Tilson-Thomas, and Zinman. His love for chamber music has led him to collaborate with the likes of Martha Argerich , Barbara Hendricks, Jean-Philippe Collard, Augustin Dumay, Pierre Amoyal, and Lynn Harrell. 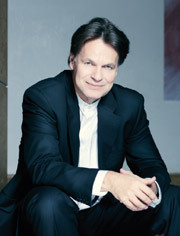 More recently, Michel Beroff has devoted himself to a career in conducting, and he currently teaches at the Paris Conservatoire. As an EMI Exclusive Artist for over 20 years, Michel Beroff has released more than 50 recordings, among them the complete works for piano and orchestra by Liszt, Prokofiev, and Stravinsky, conducted by Seiji Ozawa and Kurt Masur. For Deutsche Grammophon, he recorded Ravel's left hand concerto with the LSO and Claudio Abbado. His latest recordings include Debussy's complete works for piano for the Japanese label Denon. Michel Beroff has received the "Grand Prix du Disque" five times. In his capacity as editor, he worked for Wiener Urtext on a new edition of Debussy's piano music. In 2006, he completed a series of fifteen masterclasses on French music for the Japanese network NHK. Concertgoers in recent seasons saw Michel Beroff playing with the LSO under Pierre Boulez, the New-York Philharmonic under Kurt Masur, as well as an extensive tour of England and Spain with the London Philarmonic. He has toured Japan three times, once with the Philarmonia under the baton of Esa-Pekka Salonen, played the complete works for piano by Debussy and Janacek in Paris, and graced the stage with the Orchestre de Paris and Christophe Eschenbach for two Prokofiev concerti. He has also toured extensively in Germany, Holland, Sweden, Finland, Portugal, Greece, Brasil, Korea, and China.